Working in a family business can be a blessing or a curse. Families that make it work are to be commended. Ones that make it work over four generations are rare indeed. 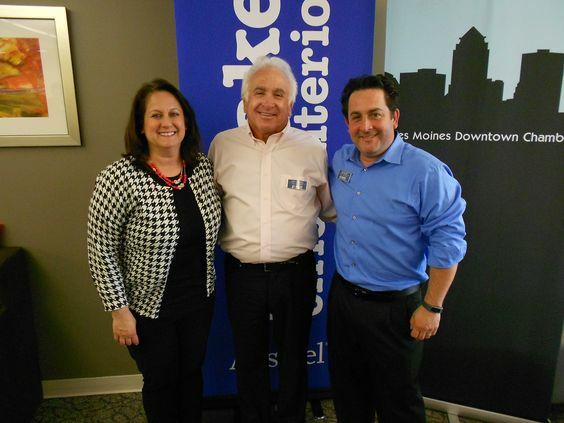 This is a story about such a family and their office furniture business based in Omaha, Neb. Harry Ferer taught the business to his son-in-law, the late Lazier Kavich, who taught the business to his son, Larry Kavich, who in turn showed the ropes to his children, Jeff and Amee, who run it today. The piece originally appeared in the Jewish Press about six years ago. As Omaha family businesses go, All Makes Office Furniture Company is one of the oldest and largest still operating. The fourth generation family members running things today stick to the same core principals, values and philosophies that have guided the business since dapper Russian immigrant Harry Ferer founded it in 1918. A go-getter, Ferer became a star agent for the Royal Typewriter Co. and the Ediphone, an early dictation machine patented by inventor Thomas Alva Edison, whom Ferer knew. 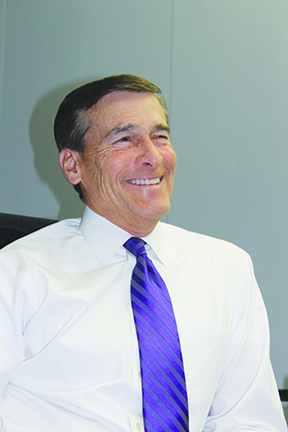 Ferer built his own company through hustle and guile, traits his successors have shown in growing the family business. Son-in-law Lazier Kavich entered the fold in 1938 and helped move All Makes forward by adding new lines, earning a reputation for fairness along the way. Lazier taught the business to his son, Larry Kavich, whose energy, people skills and “do the right thing” motto drew in new business. Larry, in turn, taught his children the ropes and now they run things. Larry’s son, Jeff Kavich, is president/CEO of All Makes Omaha and Jeff’s sister, Amee Zetzman, is president/CEO of Lincoln, Neb. and Urbandale, Iowa. The legacy continues. Only time will tell if Jeff’s or Amy’s kids one day carry the torch. All Makes evolved over these 88 years into a full-service center that outfits offices of every size, located virtually anywhere, with products that range from the latest in work station systems to used desks, chairs and files. The company does more than just sell stuff. It also designs and installs office spaces for all kinds of settings, offering expertise that makes today’s technology-rich environments user-friendly. Any firm as long-lasting as this one adapts to meet the needs of customers in changing business climates. Through world wars, economic downturns and industry trends, All Makes stays the course, each generation adding fresh ideas to the mix. Much has changed since Harry Ferer opened his downtown typewriter sales, rental and repair shop. When Lazier Kavich came aboard, the business added office furniture to complement the automated machines it carried. In 1950 All Makes moved to its present location at 2558 Farnam Street. By the 1960s the company added the first of its branch showrooms and stores. Once Larry Kavich joined in the mid-’60s, high end contract furniture became the staple. He expanded the business physically and enhanced its position as a multi-product, multi-service center. He continues as chairman today, wintering in Arizona. 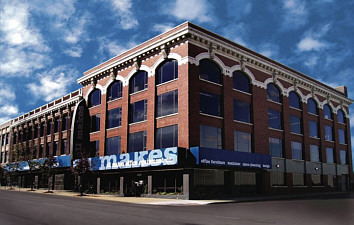 Under Jeff’s and Amee’s watch from the late 1990s on, All Makes has added to its facilities, including new showrooms and warehouses, made a series of renovations, grown the company’s design division and expanded into international markets. Yes, much has changed. Then again, people are still people and business is still business. Office furniture may be wired today, but getting repeat customers still comes down to treating folks right, qualities sorely missing from so many service providers today. Jeff and Amee keep alive All Makes’ service-first credo, drawing on lessons from two masters in the art of the deal — their grandfather and father. As kids, Jeff and Amee were always around the business, working there summers. He learned all facets — from stock and sales to delivery and installation. She applied her gift for number-crunching to the company books. But he knew where his destiny lay. For the young Amee, the business wasn’t so much a career path to follow as a place she felt obligated to pitch in. Her math and computer skills were put to use. As a boy Jeff accompanied his dad on business trips. Trussed-up in a coat-and-tie, the little boy said little but absorbed much as Daddy made deals. “I was there watching him do what he does best and that’s an education you won’t learn at Wharton School of Finance,” he said. When Lazier, who passed in 1996, wasn’t playing cards or handicapping the ponies, he was striking bargains that brought in new business or that added to his overstuffed back office, which has been preserved intact as a kind of memorial. The walls and shelves are still filled with kitsch collectibles. He loved acquiring things in bulk in order to give them away, like the drawer of surplus watches he kept. True to his salvage roots, he built All Makes’ used office furniture segment, now called All Makes on Two, which still accounts for a robust volume of sales today. Sections of two floors, plus the basement, practically sag from all the used items on display. At one time, three generations of Kaviches drew wages together. “It was something special that I’ll never forget and I know it’s so rare and something few people get to experience,” Jeff said. Lazier, the old-school wheeler-dealer who started in the junk business, was the elder statesman. He read the mail, saw a few old customers and played cards with his cronies in his office. “This is what he loved,” Jeff said. Larry was the dynamic leader closing deals in the showroom, on the phone or on the road. Jeff and Amee were the fresh-from-college upstarts soaking it all in. The lessons learned from these old-school salesmen made a deep impression on the next generation. Much of what Lazier and Larry did still shapes the business. She utilizes some of the managerial tricks and rituals he taught her years ago. More a benevolent figurehead by the time Amy and Jeff assumed titles and positions at All Makes, Lazier still came to the office every weekday, modeling the Golden Rule in his good works and in his high ethics. Years ago he befriended a blind black evangelist known for traversing the city on foot selling brooms. A tradition began that saw Lazier invite the Rev. into the store for a repast before driving him home at night. The preacher man still stops by on his circuit and Jeff and Amee, like Larry and Lazier before them, make sure he’s well taken care of. The siblings feel an obligation to maintain the family tradition in All Makes. “It’s so important for me to make sure we do provide the best product at the best possible price, along with the best service, because our reputation means so much to us. We just always want to play cards up on the table and do the right thing for all of our great customers,” Jeff said. Groomed as he was to take over as president from his father, Jeff said, “I always knew it was coming,” but added “it never really sunk in until it was on my business card. You always had Larry to fall back on before on making some decisions. But when now it’s my deal, I’m very cautious about what I’m going to do before I do it.” Easing the transition, he said, was the way he worked side by side with his father. Unlike her brother, Amee didn’t always see herself in the All Makes mold. The first order of business was making sure she and Jeff could share power. “I called my brother and we started talking about it. I asked him, ‘What do you think? Do you think we could make this work?’” He told her yes and in 1994 she joined the team. They’ve found a way to make it work for 12 years now. The family “works hard to make it work right,” Amy said. “We had a consultant come in and help us separate everything so we had some type of framework to try to work within. Before, we didn’t have titles…everyone just did what needed to be done, which is still the case, but now we have a more clear definition of what our responsibilities are. I think so many times family businesses don’t have a plan and everyone thinks they’re in charge of everything” and it becomes a real mess. All Makes has won area recognition as a model family business and small business and industry-wide awards as a top dealer. Among other things this next generation in business has taken from their elders is a commitment to downtown. “Yes, we are downtown to stay,” said Amee, who added all the development activity there, including a run-down apartment building converted to condos in back of All Makes, has only strengthened the family’s stake. She said All Makes acquisition of properties around its store realized a “Lazierism” that went — “always buy property near your business when it becomes available.” Lazier also taught her to “never be embarrassed by what you’re going to offer. And that’s how all these properties were acquired,” she said. She and her brother have also remained committed to the loyal work force, whose average length of tenure is 12 years, Lazier and Larry built. “We have great people here. We like to think it’s a great place to work,” she said.